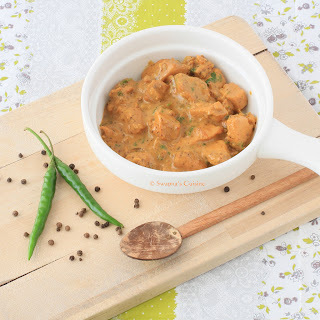 Spicy Chilly: 'My Spicy Recipe' ~ Event Round Up and Announcement of Winners! 'My Spicy Recipe' ~ Event Round Up and Announcement of Winners! The initial decisions of picking out winners by 'draw' slowly got diluted due to the fabulous entries sent by the enthusiastic participants!. Let me thank, first of all, each and every one for the amazing entries! Now, I had to decide laying criteria for judging. All I could think primarily were, the recipe, presentation and photography. But then, I had a lovely bunch of entries with pictures of professional quality and presentation from my closer knit of friends. They were particular to encourage the deserving new bloggers and mentioned lovingly that they were offering the entries considering the friendship. I love that! So, I affectionately placed this irresistible bunch gently at the back seat, mingled with the overwhelming feeling of perfect understanding! Let me thank you, sincerely! New criteria that got added were: the choice of the recipe, uniqueness of the entry, whether the recipe was sent over exclusively to the event "My Spicy Recipe" or shared with other events of the period, addition of the event logo and online shopping tips, though they were not insisted. I was also looking out for more, which stood out from the rest, again giving consideration to newer bloggers. One recipe was accepted per blog. But then I saw bloggers who held 2 food blogs in different languages and blogging different recipes in both, updated promptly! Holding one food blog, regularly updated, is more than hard work. As bloggers we know how to tough it is to maintain 2 food blogs that too one in English and the other in a regional language! Asiya Omar and Jaleela Kamal, girls, I am impressed! She was one among the contestants who mailed me expressing her deep interest, clarifying her doubts and rather fighting with the bad connectivity she had been experiencing, exchanging at least 3 dozens of cheerful mails. Her Paruppu Adai or the healthy lentil pancakes from her Tamil food blog, Samayal Attahasangal had been unique, the only breakfast recipe here, and the step wise traditional recipe of the Spicy Aathur Pepper Mutton from her English food blog , Cook Book Jaleela had been contributed exclusively for the event. She was innocently worried about the not so well presented dish, until I consoled asking to leave as is. I succumb to your innocence, honesty, enthusiasm, and hard work. Congrats, Jaleela, You go first! She manages My Healthy Happy Kitchen, the English food blog and Samaithu Asathalam, the Tamil space with much effort and talent. She updates them regularly with stepwise pictures with varied recipes and cuisine. The only contestant who shared the online shopping tips above the recipe post in both her spaces and the third contestant to send over the entries. I received the homely Milagu Thanni Soup and the Spicy Pepper Prawn from her bilingual blogs within the first five entries! Asiya, for your hard work, enthusiasm and talent you get the second with a close score! The first impression is the best impression! I saw my logo not only under the recipe post but also in her side bar, throughout! Simple and good Egg Curry sent over by Divya Shivaraman from Dishing with Divya bags the third prize. Well, this is not going to mean mean that the others are not competitive and deserving. I find even many appealing and equally good though I do not make a note here. Wish I had the choice of giving 43 prizes that all of you would be rewarded!! Sadly, I am restricted with the first three. Let me individually enjoy and appreciate each and every entry here. Nothing matches the love and concern combined in the dishes, though! This spicy heartwarming Milagu Thanni or the Pepper Soup is from Asiya Omar had been one of my favourite recipes which was contributed very early for the event. Asiya is the author of Tamil and English food blogs! One of the prettiest and unique entries! 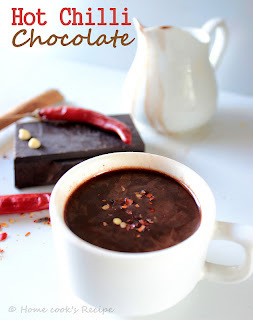 Lavi, I am spell bound with this Spicy Chilli Hot Chocolate! Beach style Kara pori is a simple snack with an interesting combination of rice puffs, raw vegetables and boiled peanuts tossed with masala. It requires less stove top but serves more than enough to liven up a beach side evening. Shared by Rak's Kitchen! Sharmilee's Lemon Aval Upma can be considered as a heavy appetiser or a light meal. 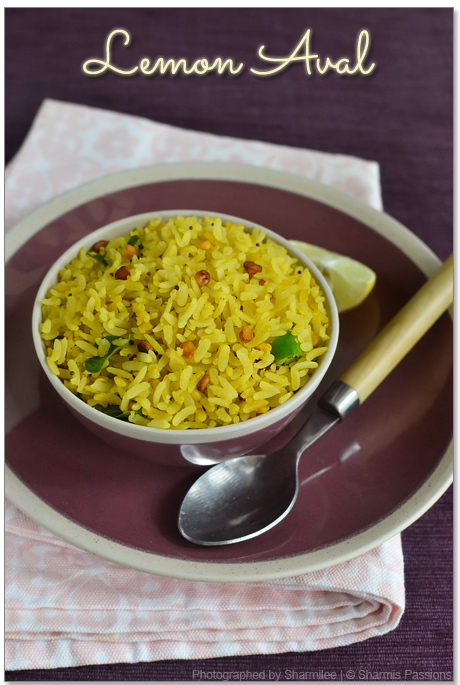 Made with poha or rice flakes, the dish is prepared with minimum oil for the tea-time munch. The colour combination of the dish, the bowl, the props and shot on the whole is undoubtedly beautiful! 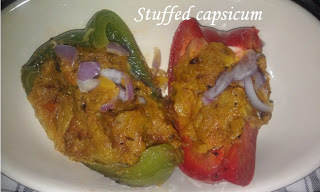 Imagine biting deep into these moist, spiced up Stuffed Capsicum topped carelessly with crunchy bits of onion! Boiled and mashed potatoes, green peas and carrots are the main ingredients she had used for stuffing the green and red bell pepper halves after spicing them up in an Indian way. 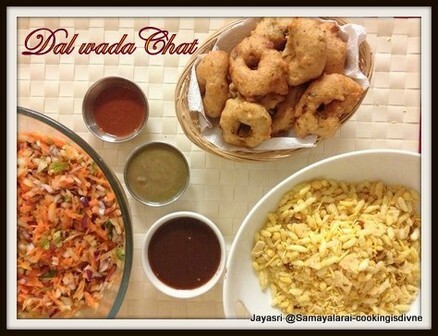 A 'delicious pick' from Foodie lover. This recipe is a fascination; a fusion of North and South. The South Indian Vadas ( let me recommend you to have a look at the ingredients used to make the Vadas) blended with the array of Northy chat flavours and combined with the goodness of Yogurt! The feasty Dal Dahi Vada Chat from Jayasri Ravi. A snack made with horse gram and vegetables! I bet these Spicy Kollu Vegetable Rolls are new to you as for me.She made my day mentioning the event prompted her to start a food blog and she did it right away, posting this interesting recipe! 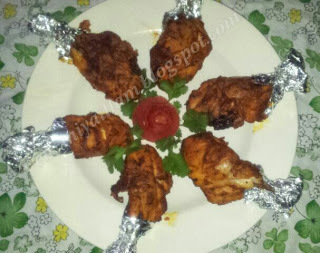 Chicken legs never lose their demand and so do these hot Spicy Tandoori Chicken on the plate. 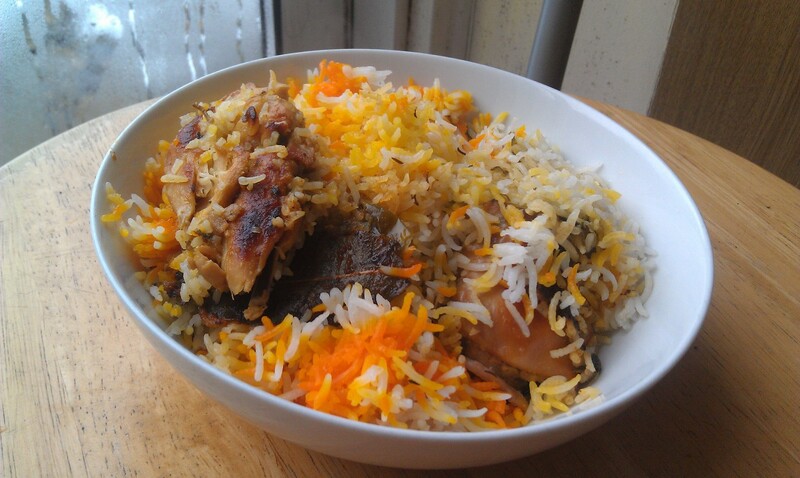 Prepared by Faiza Kader. Shared by her Tamil Blog, 'En Iniya Illam'. Don't these buns look perfect and more than gorgeous? A healthy combination of rice and dal makes a healthy start for the day too. 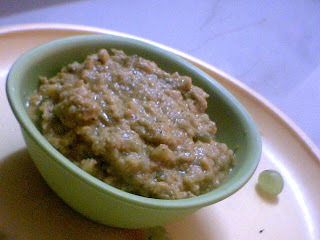 Paruppu Adai from Jaleela Kamal. She is a busy homemaker who manages both Tamil and English food blogs! The first girl who promised me to send over the entry. 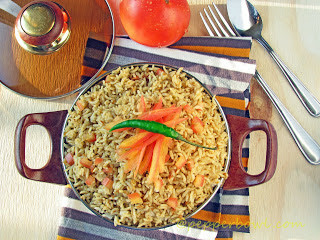 She kept her word by sending over her Spicy South Indian Tomato Rice. 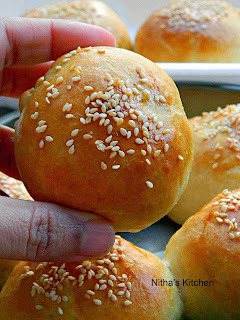 A lovely recipe with pictures of aesthetic sense; from Pepper Bowl! Have you thought of making something tangy and spicy with quinoa? Well, Priya Sahasranaman has ventured the differently delicious Quinoa Puliyodarai! She also substitutes quinoa for the rice part in curd rice, pulao and even Khichdi! Meena Selvakumaran had perfected the elaborate recipe of Dum Chicken Biriyani in a simpler way urging the non vegetarian biriyani lovers to give a shot! Here's a treat from another spice lover. Princy's Prawn Pulav - A simple but great meal for prawn and pulav lovers. 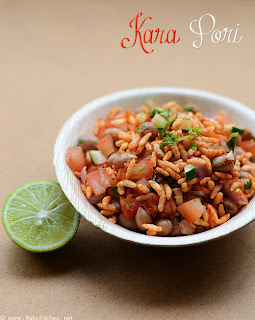 The rich red colour, the blend of spices and the moist look of the pulav is simply mouthwatering! 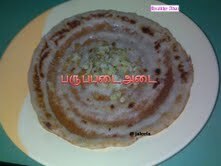 Who doesn't love this dish called 'Kothu Paratha'? Babitha Costa's Beef Kothu Paratha provides a sumptuous lunch for a non-vegetarian who likes beef! 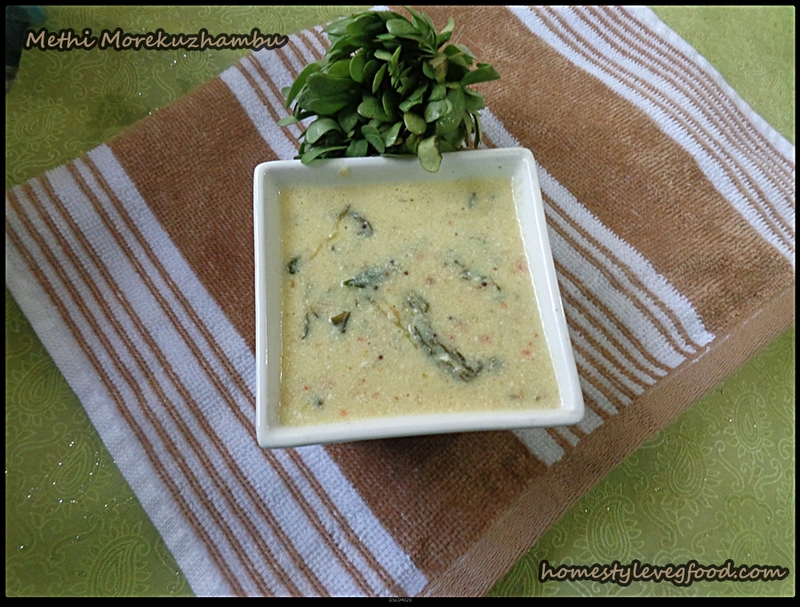 How many of you had thought of a combo of methi leaves and mor kuzhambu? 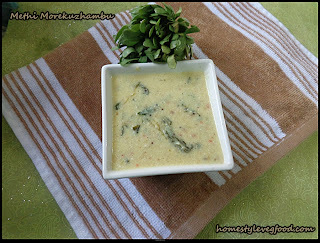 Aparna Rajesh Kumar elaborates with her stepwise of the flavourful Spicy Methi leaves Morkuzhambu in her space. 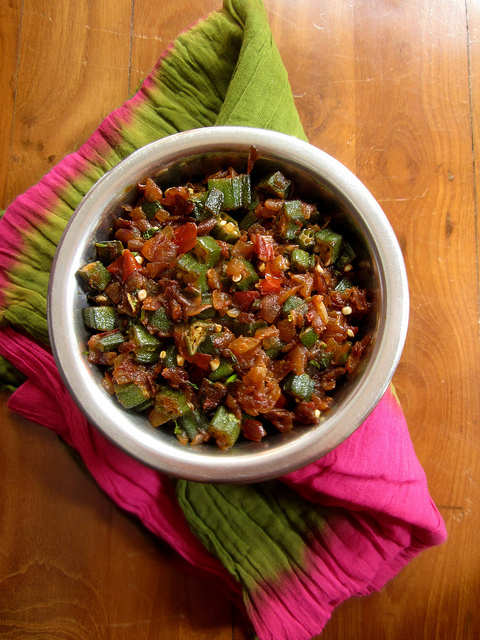 A guilt free side dish with the healthy green vegetable, ladies finger or okra. Imagine you are living far...far away in a country quite far from your native home. 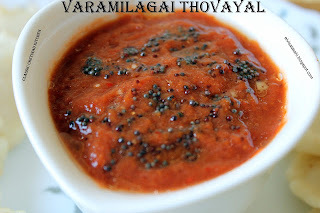 Recreate a kuzhambu with all the goodness and flavours back home. Have it for lunch! How would you feel?I am sure Latamma felt heaven, when she made the very homely Karuveppilai Poondu Karakuzhambu with all her love! I am sure many of you love biting into crunchy, juicy bits of young corn soaked in a flavourful gravy! Sharanya's Baby Corn Gravy made with freshly ground Indian masala is a traditionally flavoured combo for Indian breads and pulaos! Here's an Indo Chinese recipe of Vegetable Manchurian with Gravy. by Linsy Patel. 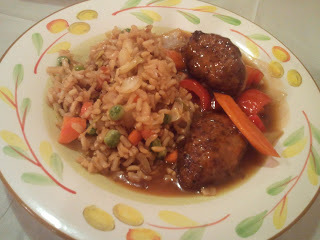 Addition of soya granules along with the veggies for the balls gives the recipe an interesting twist. Honestly, I haven't heard of Rogan Josh made with Mushrooms. 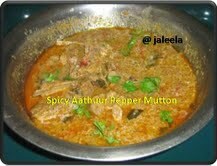 The innovative Mushroom ki Rogan Josh with stepwise illustrations from Arthy Shama. 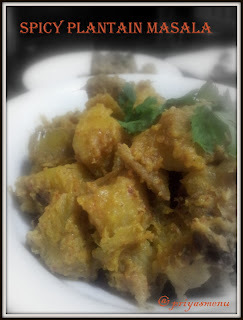 If you are bored with the regular recipes of raw plaintain, give it a twist, following the recipe of Spicy Plantain Masala prepared by Priya Satheesh. The picture says it all. 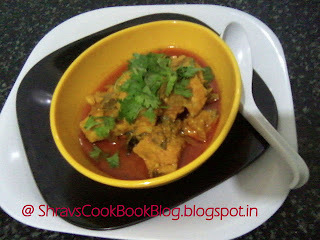 The yummy spicy red hot Mushroom Chops by Shama Nagarajan. 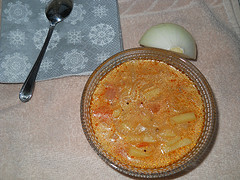 If I am right here, Vengaya Kose is one of the Tamil recipes which is disappearing from the tables of the state. This simple but special side dish is prepared and sent over by Meenal Ramanathan. Quite an appealing and innovative dish. 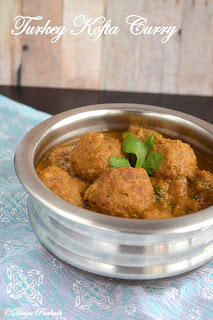 Spiced Unripe Banana Balls in Rich Gravy, contributed by Anshu Bhatnagar. 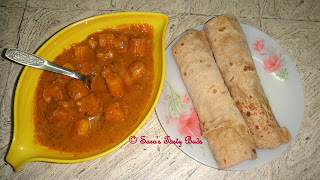 Spicy Gavarfali Dhokli or Cluster beans with wheat flour dumplings is an interesting combination! "Dhokli can be had as it is or with roti, But we normally have them as it is," says Manjula of Desi Fiesta. 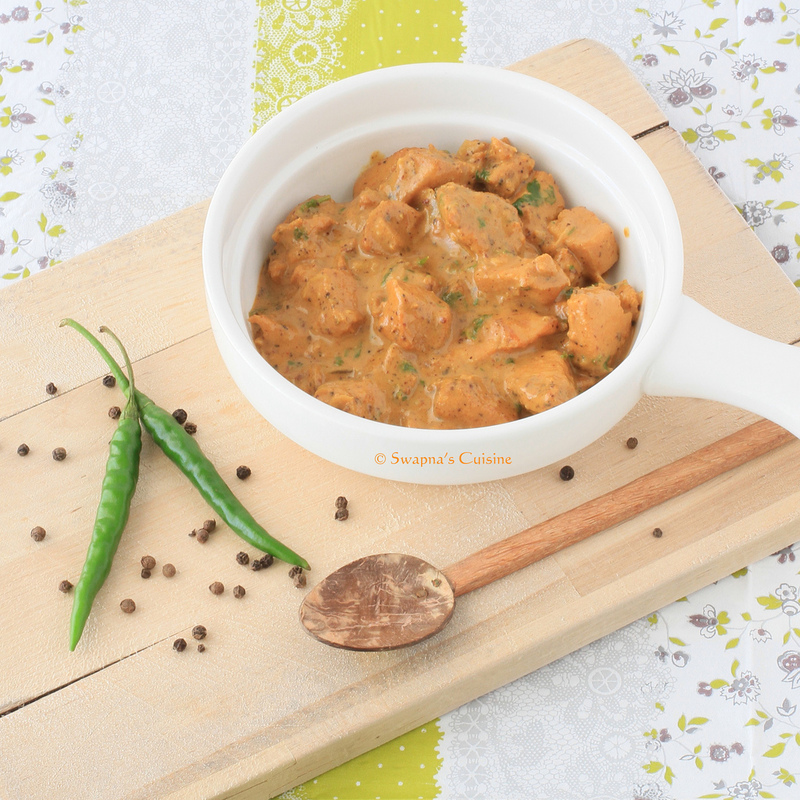 Don't you think this Pepper Chicken Masala from Swapna is classic? I love the ingredients of the recipe and the pastel shades in the shot! 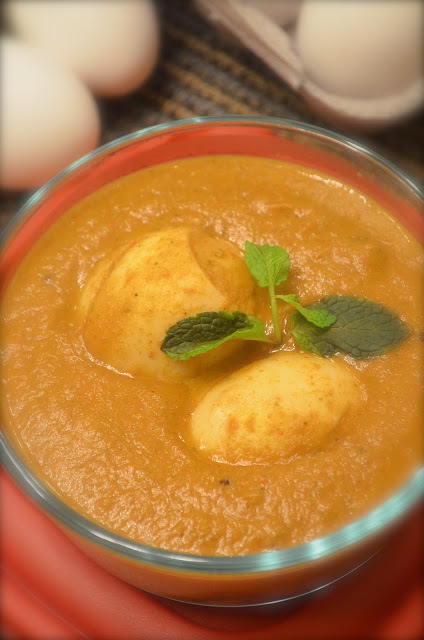 This simple Egg Curry from Divya Shivaraman has captured all the goodness and creaminess in the final picture. The clear stepwise illustrations with sharp shots were one among the first entries, that stole my heart. 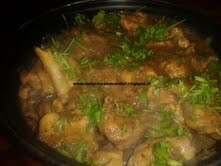 A very homely Pepper Chicken curry from Tinku Shaji. Turkey Kofta Curry is sure to delight the soul of any non-vegetarian. A glimpse from 'Divya's Culinary Journey. 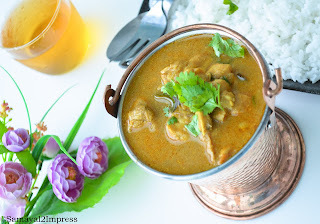 Even a simple looking curry can be capable to lock most flavours. 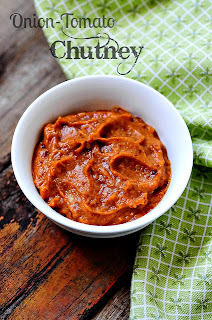 The Spicy and Perfect Shrimp Gravy which Usha suggests, is a good example! Spicy Chicken Curry topped with lots of coriander greens is more than appealing for a chicken lover. Shrav's chicken curry illustrated stepwise is not an exemption to that! The pretty looking Pattukkottai Chicken Curry is one among my favourite entries. Revathi owns a neat blog with lovely pictures of food she cooks. With a burnt shell of coconut, butter, topped with cloves, Latha has brilliantly induced a smoky flavour to her perfectly done Boneless Smoky Chicken. 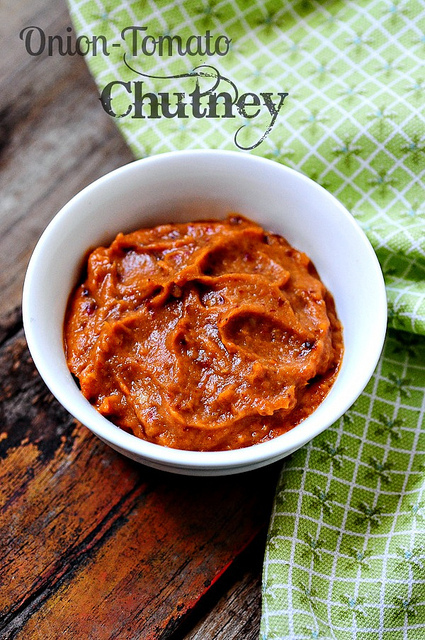 This Red Hot Spicy dip is from Lakshmi Venkatesh. 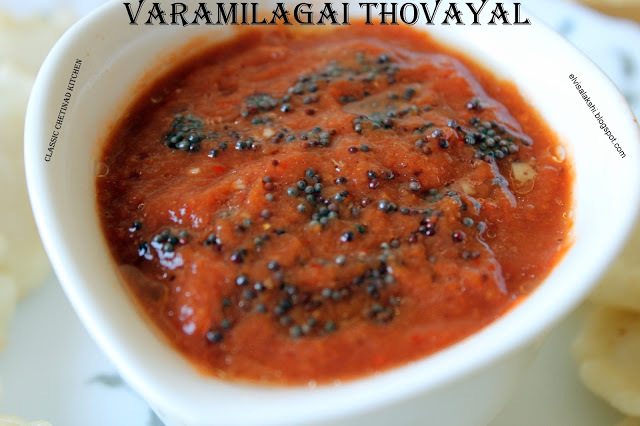 Enough to make any cheeks hurt, the fiery Varamilagai Thovayal is the traditional combination with Vellai Paniyaram of Chettinad Cuisine! The picture catches the attention! 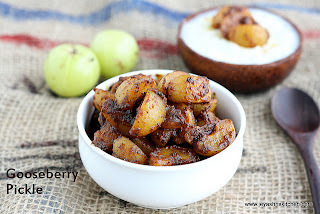 The lovely Gooseberry Pickle send over with much enthusiasm by Jeyashri Suresh. Green Bell Pepper and Green Chilli Pickle dip from Chithra is a very different chutney with a combination of two kinds of peppers! 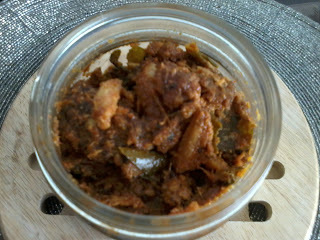 I still dwell upon my doubts if anyone has a better recipe for 'Fish Pickle' than the Keralites! I missed participating as I was travelling. Great roundup Bharathy!!! Congrats to all the winners!!! Great roundup gal and congrats to the winners. Am sorry that I missed this as I was pretty held up with work. I am very excited.Thanks Bharathy. Congrats to all participants and the other winners Jaleela and Divya..Great round up. Congrats to the winners, even am impressed to see that they both manage two blogs, beautiful roundup and you did a wonderful job. Wonderful roundup and appreciate your sincere description about each entry :) Congrats to the winners!! Congrats winners.Wonderful roundup.I was very happy to participate in u r event. Wow Amazing Round up Bharathy and I am appreciating , you have described all participants recipe,really great.All participants recipes are delicious.I am really happy to hear,that i am a winner in spicy chilli , Congrats to Asiya and Divya. Congratulations to the winners and thanks to the participants for a the wonderful recipes, some of which I have bookmarked already. Thanks Bharathy for bringing all of them together in one website. Great roundup dear..!! Congrats to all the winners!! Firstly, thank you Bharathy for coming up with the event. I am finding it hard to choose which one would be on my menu in the coming week, first. I am sure going to try as many vegetarian entries. Congrats winners..and Congrats for Bharathy too, as he hosted a wonderful yet successful Event!! Congratulations Jaleela, Asiya and Divya and everyone else who participated in this event. Jaleela and Asiya, You guys inspire me. Kudos for all the effort you put into your blogs. 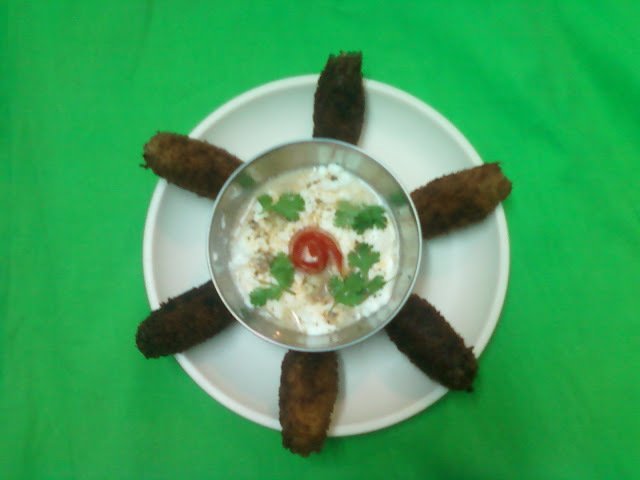 Bharathi, I am taking away few inspirations and recipes. Thank you for hosting and sharing it with us. What an astounding array of dishes, Bharathy. Congratulations to all the winners. Great job, Bharathy! Congratulation to all participants and winners for their effort. I was too lazy, I suppose. Maybe next time!